If there is one continuous theme that runs throughout our nine roundtables, it is the impact the Internet has had on the news media landscape. Following the launch of the Netscape browser over ten years ago, news media outlets ventured in, offering online versions of their news products. Then, as online-only properties like Google and Yahoo began attracing large audiences as well as ad dollars, traditional media companies worried that the Internet would undermine and ultimately shatter their business models. In the last couple of years much of the mainstream press has finally begun to actively pursue an online identitiy. Now, there is much debate over whether we may soon enter an era of cooperation between old and new media, of original content providers and content aggregators. In the meantime, we continue to see non-traditonal upstarts like YouTube, a video sharing site, attempt to bypass the mainstream media, even as the MSM documents its trajectory. In this, our final roundtable discussion, we invited bloggers, the head of a think tank, and an academic to discuss the future of online media and what may expect to see in the near future. Dan Gillmor, a Bay Area-based blogger who was previously a columnist for the San Jose Mercury News. An expert on technology and other issues such as copyright law and citizen media, Gillmor is the author of the book, We the Media (2004,) available as a free download. He is currently the Director for the Center for Citizen Media. James “Jay” Hamilton, Charles S. Sydnor Professor of Public Policy Studies at Duke University. Professor Hamilton’s research interests include media policy and television violence and he has authored or coauthored six books, including All the News That’s Fit to Sell: How the Market Transforms Information into News. He holds a Ph.D in economics from Harvard. Robert Cox is the founder and president of the Media Bloggers Association, the largest association of bloggers and citizen journalists in the world. Lee Rainie, the founding director of the Pew Internet & American Life Project located in Washington DC. Prior to his tenure at the PIP, Lee was the managing editor of U.S. News & World Report. Jeff Jarvis, a former critic for TV Guide and People magazine who now blogs at www.buzzmachine.com. Jarvis is also a consultant for the New York Times Company and will become an associate professor and director of the interactive journalism program at the City University of New York this fall. 1. In our reporting we were told traditional news companies finally appear to be investing in building their web presence. Yet much of that of investment may be in technology (both software and hardware) rather than in personnel to do more information gathering and original reporting. Do you think traditional news companies have turned a corner in their view of the web? Do you think they are investing in the right place? And how much confidence do you have they can innovate the web better than Internet only companies like Google, Yahoo or others? Jeff Jarvis: Sorry to say, too many still can’t see the corner, let alone turn it. I hear courageous and visionary statements from Europe – from the editor of the Guardian, who knows he now owns his last presses; the CEO of Reuters, who acknowledges that the public is now the editor; the head of the BBC, who is exploding his network; the proprietor of Burda, who says he is investing in online social software (not content); the head of Gruner + Jahr, who says the role of the journalist in the future will be that of a moderator. In the U.S., I too often hear news executives talk about saving newspapers and newsrooms. The old structure must change. Lee Rainie: …Our research shows that traditional media organizations still dominate online news sources, and foreign and non-traditional news sites play more of a niche role. But as more and more of the online audience makes the internet their primary source for news, the advertising dollars will flow away from television and radio and into the outlets that engage them the most. It’s hard to see how internet companies could eclipse traditional news companies on the news because they are utterly dependent on MSM to provide them their raw material. Perhaps the right way to couch this would be to say that news companies should watch what Google and Yahoo do successfully in news innovation, then adapt it to their own operations and do it better. The innovator is not necessarily the winner. Robert Cox: If I were running a traditional news outlet I would be looking very closely at Technorati, Backfence, Pegasus News, Westport Now, iBrattleboro, MSNBC, The Greenboro News-Record, and other innovators. I would look to adopt those tools and methods that can be technically integrated into my existing news site without huge development costs, staffing a citizen media group within the news organization and enlisting the help of “outsiders” in the form of blogger/consultants primarily so I can understand my new “neighbors” in the blogosphere. I would certainly want to make sure I understood the “neighborhood” before venturing out into it and avoiding the kinds of mistakes the L.A Times made with their Wiki. Dan Gillmor: The investment is important, but the innovation from traditional players is minimal. Repurposing our old stuff is not innovating. There are any number of ways to approach innovation on the Web. One is to truly use the medium — to imagine journlaism without the constraints of the traditional manufacturing model. Another is to ask the audience to join the process. Merely creating staff blogs is grossly insufficient, however. The key thing is to try lots and lots of experiments, toss what fails and improve on what doesn’t. 2. Now moving specifically to blogs. Blog readership, according to survey data, seems to have stalled in 2005. Content analysis also shows there is little of what we most would think of as original reporting in blogs. Yet they often write about events outside the purview of the mainstream press. How ultimately do you think blogs and other citizen media will affect news reporting in America? Will we ever see them as a more significant, or even equally important part of the mainstream American news diet as traditional journalism? I would guess that the actual number of readers of blogs is up dramatically but that it is masked for several reasons. First, most active blogs cover politics and as 2004 was an election year, it should be no surprise that there was a spike in blog traffic between the Conventions and the Election. Second, going into 2004 few news organizations had their own blogs and since then, many of the most widely read blogs are now contained within sites run by news organizations and they do not break out their traffic numbers. Third, the widespread adoption of RSS among blog readers, the integration of RSS readers into the latest browsers has meant that an increasing number of blog readers need never visit the site and so are not counted as “unique visitors” by tools like SiteMeter……[Click here for more of Robert Cox’s thoughts on the future of the blogosphere]. Dan Gillmor: There may not be much original reporting in blogs as a percentage of all blogs. But given the enormous number of blogs, it takes only a small percentage of them to do original reporting to add up to vast new amounts of original content. The most common kind of reporting is in niche topics that are too narrow for the traditional media and people who care about those subjects are finding some excellent journalists. Professional journalists, meanwhile, are constantly using blogs as tip sheets, much as they’ve used trade journals in the past. The best way to begin to understand the blogosphere is to join it, of course. When journalists use blogs (and other conversational media) they start to realize that the conversational aspect of this medium is the key. Remember: The first rule of a conversation is to listen — and listening has not been professional journalists’ most notable trait. The right question to ask is how blogs and mainstream media can work together to improve journalism and an informed society. You should be asking how any mainstream journalist could possibly imagine not doing his or her job without the help of the public through blogs. Lee Rainie: First, reporters will increasingly feel compelled to read blogs to take the temperature of the public on issues, as a source of inspiration for story ideas, as good substitutes for man-in-the-street interviews, and for feedback on their own work…Second, blogs will probably introduce new subjects for news organizations to address. Third, the most important power of blogs is that they allow millions of niches to bloom. Fourth, blogs could become a standard source of information on big breaking news stories. Fifth, bloggers will continue to play the role of forensic analysts and dissectors of mainstream news coverage. Sixth, bloggers fill the inevitable gaps in news coverage and add perspective to news commentary … I think bloggers in most circumstances will continue to be seen as supplementary contributors to MSM news work rather than as substitutes for MSM activity. 3. Do you think the economic model of the Internet has to shift from an advertising based model to something else for traditional journalism to survive at a level that we have become accustomed to? If so, do you have any thoughts on what that new model might be? James Hamilton: Media economics online are the most dismal for hard news. Four possible scenarios to generate more online content about public affairs are 1. Subsidize local watchdog journalism, perhaps through the creation by nonprofits of data and analyses that point to local problems… 2. Charging for content can work when people have intensely held interests. The product will have to be highly differentiated, e.g., the Times can charge for columnists but not breaking news. 3. Determine how to use information about reader interests to link local advertisers to local readers or aggregate local readers to national advertisers… 4. Keep the Federal Election Commission out of Internet content regulation. While profit-oriented media outlets may not always have incentives to cover public affairs, parties, candidates, and interest groups do have incentives to reach voters…I hope the lines continue to be blurred on the Internet so that political information, even partisan-funded information, is less regulated there. 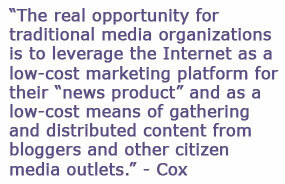 Robert Cox: The real opportunity for traditional media organizations is to leverage the Internet as a low-cost marketing platform for their “news product” and as a low-cost means of gathering and distributed content from bloggers and other citizen media outlets. A good example of one potential model is Countdown with Keith Olbermann on MSNBC. For national news broadcast this show could not be much cheaper to produce. The show is shot using two cameras, one stationary and one on a boom. The set is a desk plunked down in the middle of the MSNBC studio in Secaucus, New Jersey. Most of the show is the host reading material from other NBC News programs. Interviews are typically with an NBC News/MSNBC reporter or analyst via MSNBC’s partnership with The Washington Post in which case they provide the remote studio. The rest is mostly regurgitated stories aired on NBC Nightly News and video clips lifted from the Internet sites like Fark or CrooksandLiars. A significant portion of the non-MSNBC promotion for the show is done online. The host was the first MSNBC blogger at MSNBC.com and the show’s producer are in regular communication with leading (liberal) bloggers who regularly feature the show on their sites and explicitly or implicitly recommend the show to their readers. In fact, the entire show is like one big video blog. Jeff Jarvis: We should be trying to find all the ways to take advantage of the incredible opportunities the internet brings us to gather more news and more diverse viewpoints from more sources and to share that more quickly and more efficiently with greater relevance. We should be looking at the role we can play in this new world: reporting, absolutely, but also helping to guide others to commit good acts of journalism and to support them with content, promotion, knowledge, trust, and, yes, revenue. Lee Rainie: It’s worth mentioning that there is an emerging notion among some online news consumers that they will pay for online content. Our research shows that perhaps a tenth of internet users have paid for content and well over a third have registered at an online news site. Slate was too early out of the box, but now steps (e.g. NYT Select) are probably going to make it work, though it is not clear whether it will make the online world as profitable as the print or broadcast worlds of yore. Clearly, the nature of the advertising model has shifted in the age of search engines. The delivery of mass audiences appears to be giving way to the delivery of small, but interested audiences. The new model might be built around “key word” or “ad sense” adjacencies, rather than the mass-audience delivery. Dan Gillmor: There’s no single model that will work, any more than there is one model now. Books are sold without being filled with ads (though the latest ideas of product placement inside books is sickening to contemplate). Public broadcasting relies significantly on the audience for direct support; when you think about this, it’s a very Web-like method, asking for audience support. Foundations are stepping up to the need; the work at the Center for Public Integrity is testament to this trend. But there will always be some combinations of journalism and advertising, because marketers will go where customers go. 4. 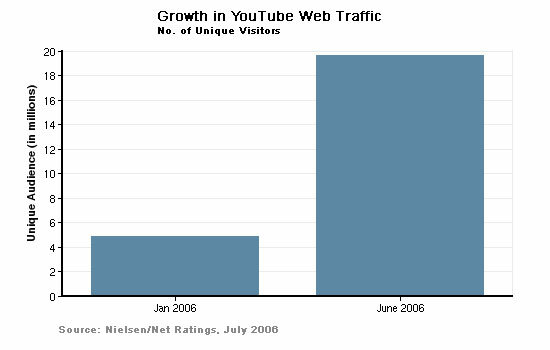 A late March 2006 study from the Online Publishers Association suggested that the audience for online video consumption hasn’t grown much in the last year. At the same time, people are downloading video to ipods and watching sporting games on their 2” screens. What seems to be holding back online video growth? Is it the technology? The quality of video? Is it that people still prefer to watch video on a television? Dan Gillmor: You can largely thank the cable/phone duopoly — high prices and low bandwidth — along with the entertainment industry, which is trying to kill peer to peer it doesn’t control, for the slow takeoff of video online. The technology is getting better all the time, and (typically younger) people are doing things with it that aren’t intended to mimic traditional TV — and winning audiences. The key thing to understand is that they aren’t part of the old guard. They are inventing something new, and we should pay attention. If and when we have sufficient bandwidth, this will be a huge shift. Jeff Jarvis: You’re trying to dismiss online video because one self-interested survey said it “hasn’t grown much.” So what you do you suggest media folks and citizens do? Throw out their video cameras? Even the TV networks and producers know better as they suddenly dare to piss off their historic channels of distribution – broadcast affiliates, cable system operators, retail outlets – to distribute their programs directly to consumers via iTunes, Bittorrent, and the web. And advertisers are still dying to get more video time online. Are they all idiots? Hardly. They are made brave by their desperation to figure out how to take advantage of this new world before they are left behind by it. 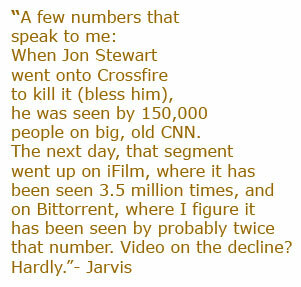 A few numbers that speak to me: When Jon Stewart went onto Crossfire to kill it (bless him), he was seen by 150,000 people on big, old CNN. The next day, that segment went up on iFilm, where it has been seen 3.5 million times, and on Bittorrent, where I figure it has been seen by probably twice that number. So, rough numbers, figure that CNN brought 150,000 people (median age: 59.5) and the internet brought 10 million (median age: much less). Now see Rocketboom, the popular video blog that has 300,000 daily viewers – twice the audience of big, old, dead Crossfire. Video on the decline? Hardly. Robert Cox: I have read the OPA press release and the PDF version of their PowerPoint presentation and do not find any trend data or trend analysis in either so I am not sure that the audience for online video consumption hasn’t grown much in the last year. In fact, the report seems to suggest that online video consumption is booming – primarily driven off of news and entertainment video. 5. Looking more broadly, one trend we sense in the media culture is the paradox of more outlets covering fewer stories. As the audiences for particular news outlets shrink, newsroom resources are then reduced, but these outlets still feel compelled to cover the big events of the day. The result is more outlets covering those same “big” events and fewer are covering much beyond that as much as they once did. How do you view this trend? 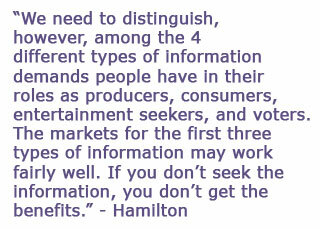 James Hamilton: I agree… We need to distinguish, however, among the 4 different types of information demands people have in their roles as producers, consumers, entertainment seekers, and voters. The markets for the first three types of information may work fairly well. If you don’t seek the information, you don’t get the benefits. Many online sources, blogs, peer-peer networks, search engines, and media outlets help people find information to help them do jobs, buy products, and simply relax. Yet the lack of influence that any one person has in politics means for many, a lack of expressed demand for political news. Papers owned by families and journalists motivated by civic responsibility once helped compensate for low demand and generate the effort needed for watchdog journalism. The potential decline of watchdog journalism at the local level is my greatest concern about media markets. Dan Gillmor: It’s foolish but understandable, given the competitive nature of the business. I don’t understand why so many media organizations send reporters to the World Series or political conventions, for example, though to be fair there is actual news made at the World Series. It takes courage to zig when others are zagging, and in recent years journalism organizations have not been known for courage. Jeff Jarvis: This isn’t a result of newsroom cutbacks. This is a result of bad news management. Once again, we must stop wasting money on commodity news and decide what our unique value is and invest in that. Do we really need to cover the same “big” events? I don’t think so. In fact, I’ve seen research from young people that screams at us to stop telling them what they already know from the internet, TV, and radio. We need to have the courage to stop covering what everyone else is covering and find stories that matter with perspective that counts. That’s real reporting. 6. Last, if online journalism could make one change in how it is operating, what would that be? Dan Gillmor: No silver bullets, sorry. The key shift is one of attitude: Recognize that journalism is moving from a lecture mode to a conversational one. Once that happens, the rest flows in a reasonably natural way. Jeff Jarvis: If only there were one change. There isn’t. They must instill fear in the culture of newsrooms to make people understand the strategic imperative for change. They must cut back on all the money they waste on commodities, editorial egos, and the fear of losing even one reader (via stock tables, TV schedules, the 15,001st reporter sent to the political conventions where nothing happens and whatever does happen you can see on CSPAN, the resources put into recreating the news others already have that the audience already knows). They must determine what makes them uniquely valuable and invest in that. They must have the courage to drive business from the old medium before it dies to the new (and, yes, the models, margins, and staff counts will not be the same).